iOS 9.3 appeared on the outset to be a good build, but since the update was released more and more users are reporting freezing issues with most in house services being affected. Various devices are being reported as affected, iPhones running iOS 9.2 are also reported to have the same bug, and various theories are emerging as are various temporary fixes. “We do not have a fix in the moment. We know about the problem and are working on a fix. It will not take very long. In the meantime installing Chrome, Opera, Firefox… will solve the Safari Issue, but not the Mail issue. Thank you for your patients, we are working on it. It appears that we had an “Easter Egg” on our apple devices, the contents are only activated when certain conditions are met, but we do not know what those are. It is affecting countries all over the globe, from Europe to Australia and appears to be spreading like wildfire. Apple must surely be responding in the background, Easter holiday or not, it is only a matter of time before they find a cure for the issue, we just need to hang five and wait, no matter how much we perceive are lives are being ruined or inconvenienced. So far I have a work round for Safari using firefox, hold a link and open a new tab from the contextual drop down menu. I have Outlook for my emails, but to be honest only tend to read emails and not follow links anyway. I will be following this story since I am affected by it, but will also post anything else that comes up, including the conspiracy theories when they start to roll out too. 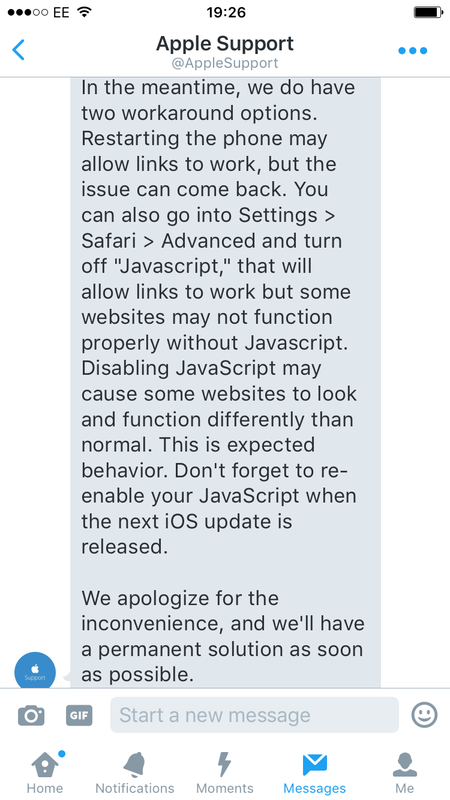 Since this issue has been growing for days I must admit I am frankly shocked that Apple Support on Twitter (@AppleSupport) are constantly replying with the same line as users turn to them for a response. As far as customer service goes I think this shows particularly bad form. There is an issue, it is widespread, say that there is, make an announcement, direct all new enquiries to that and stop wasting peoples time. They told me it was an iOS issue and that their engineers are working hard on releasing an update very soon. They even were working on the bank holidays (Easter).